Breaking the Habit of Clutter: Keeping Your Living Space Tidy in a few Simple Steps! Any woman who understands the problems of running a home will be nearer to understanding the problems of running a country. – Margaret Thatcher. Home is a sanctuary. I know I probably refer to homes as such a place often but nothing has more truth. After a long and hectic day at work, I look forward to retreating back to my sanctuary more than anything else, however, like many, I often come home to a cluttered home, and simply add on to it more and more after each rough day. I admit it, I am not one to want to hop on the chores after work, but I’ve come to realize I am more relaxed and feel better about how I am living when I surround myself in a clean and tidy home. It is impossible to clean a house properly with clutter everywhere, it makes it especially hard if you hire a house cleaning service. All personal items, trash etc removed from main living areas and put in an appropriate place reduces clutter and makes it easier to do a thorough clean. The ability to keep better track of your personal items. It is especially important to have a tidy house in the off chance your house gets burglarized, knowing everything has a place makes it easier to do a quick inventory after a burglary or saves you the hassle of searching through the house for your headphones. Reduce stress! There is no need to get angry over missing the first few minutes of your favorite TV show because you are searching for the remote, no need to get frustrated when cooking in the kitchen because random clutter crowds your counter space. Make it clear to everyone in the house that if they all work together then a tidy, clutter-free home is possible! Plan, discuss with everyone what their responsibilities will be, including everyone keeping track of their personal items. If you have children in the house write up a chore list (or add on to your existing chore chart) with simple instructions (i.e; collect all trash in living area in the a.m., put away any out-of-place personal items in the afternoon ). Next step would be put the plan in to action. Work together, start off in one area of the house and do not move on to the next until said area is complete. Remind yourself and others that everything has a place. Everyone should already know of a designated place for their belongings, however some training may be involved to make it a habit. Once everyone has gone through every part of the house and claimed all personal possessions, do a quick walk-through of the house and pick up and throw/put away any trash or left-over random items (i.e; bills on the living room table, dishes on the counter, vacuum cleaner in the hallway etc). Encourage and Reward! Aside from the rewarding feeling of walking into an orderly home, motivate the whole house with little rewards, and if needed some consequences, while introducing the new clutter-free regime. Reward with little things, such as extra computer time for the kids if they kept track of their personal belongings all week or did not have to be asked to put away their items. Create consequences (i.e; if you are constantly asking your child to pick up his or her video games in the living room, put them away in your closet for a week) to prevent bad habits from lingering. 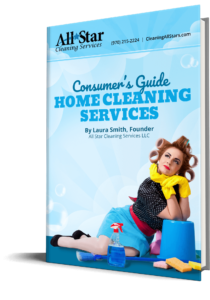 Finally, once you have transitioned into a house-that-is-serene (instead of a house-that-makes-you-scream) you may want to consider (if you haven’t already) hiring a house cleaning company to help keep your home at its best (and so you can relax and rest! ).